I am not new to books that talk about style, fashion and makeup. In fact, I have been blessed (as gifts by very thoughtful people) with many excellent publications from InStyle, Lucky, Nina Garcia, Tim Gunn, Kate Spade, and Bobbi Brown. However, there is something so fascinating about a book talking about the same things but from the perspective of our Creator -- the very One who fashioned each of us so that we may be the highest representation of what He sees as beautiful. Interesting isn't it? More about that later. 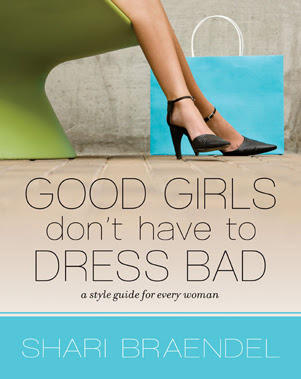 First and foremost, the book is loaded with practical advice for both the clueless and the fashion-savvy. Now the better stuff. Author Shari Braendel deals with deeper issues that women typically associate with beauty. Some of us have a hard time grasping the idea of being "fearfully and wonderfully made"
Braendel made a very thoughtful attempt to clear these issues out before the practical lessons. It was not in-depth but it was a strong start. I hope that it will encourage the book's female readers to dig deep into the Word in order to figure this part out. I feel that it is necessary to sort out the junk inside before doing work on the outside. Disclosure of Material Connection: I received this book free from Zondervan as part of their Blogger Review Program. I was not required to write a positive review. The opinions I have expressed are my own. I am disclosing this in accordance with the Federal Trade Commision's 16 CFR, Part 255: "Guides Concerning the Use of Endorsements and Testimonials in Advertising." My eye will be on the look out for this book! Thanks for the review!! !